Less than a week after the project was first presented to the Waterfront Toronto Design Review Panel (DRP), Menkes‘ LCBO Site had its first public consultation at the Novotel on the evening of November 28. In front of about 70 people, architectsAlliance (aA) and B+H Architects presented their vision of how the site could be best developed, while keeping in line with the planning goals established in the City’s Lower Yonge Precinct Plan. To summarize last weeks’ introductory design review article, the initial concept proposed a rezoning for development on four blocks, with seven towers total. 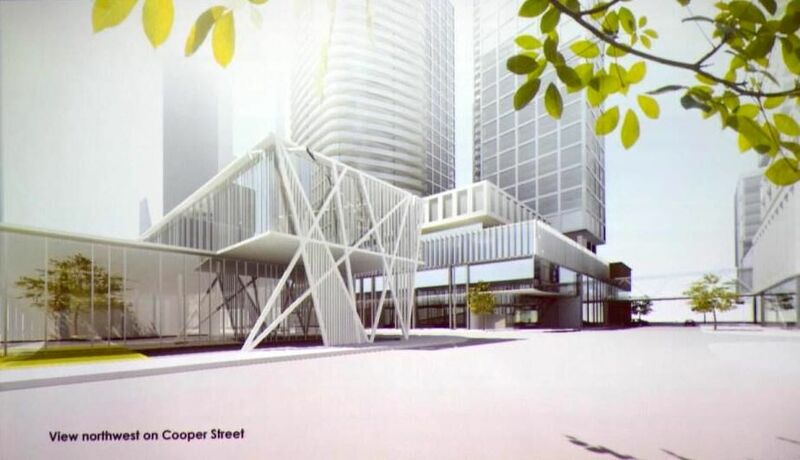 The new LCBO headquarters would rise 24 storeys on Block 1 at the southeast corner of the site, 74 and 76-storey residential condominiums would rise on Block 2 at the northeast corner, a new park with a pavilion with retail at-grade would be sited on Block 3 at the southwest corner, and finally Block 4 in the northwest corner included condos rising 85, 80, 70, and 65-storeys. All the blocks would be connected through the PATH system. Overall, the plan is to add about 25,000 residents and 10,000 workers into this precinct. 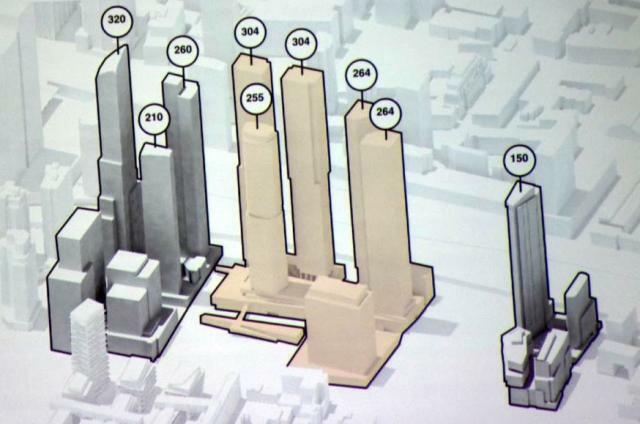 In the time since the proposal was submitted in May, there have been revisions, the most notable being the elimination of one tower on Block 4, with the density reallocated to the other towers. Now, Block 4 has three towers, two of which are twins at 304 metres and 89 storeys tall, while the smallest condo tower is now 75 storeys and 255 metres in height. Block 2 has also grown in height, as the two towers rise 80 and 79 storeys, both at 264 metres tall. aA have also included an elevated PATH system acting as a series of bridges over different parts of the site. Principle architect of aA, Peter Clewes, stated during the consultation that the PATH Master Plan intends that this area be connected to the rest of downtown network, to provide weather protection in inclement weather. The plan also increases space for pedestrians, more than 4,000 of whom are expected to walk to work Downtown once the area is built out. Clewes remarked that people will be taken off the streets one way or the other, whether above or below grade when crossing roads. While many see bridges as blights, Clewes posited that bridges can also bepart of the architectural vision for a development. The Precinct Plan suggests that tunnels would be better to create a livable, vibrant, and active street life. The public presentation showed slides of the same concepts shown to last week’s DRP. 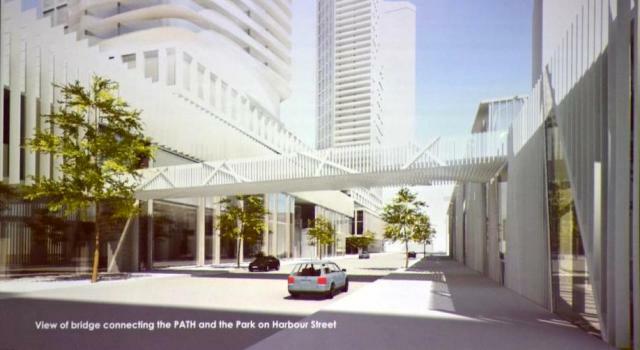 As stated again by Clewes, the images should be understood merely as conceptual massing models to help examine ways to best orientate the towers, PATH connection possibilities, and streetscape design. One comment was made on the positioning of the school, and why it was not placed beside the park. Clewes responded, saying that the option was considered, but would heavily compromise the size of the park. As well, the Toronto District School Board would prefer the current placement as it would be directly east of the new community centre in the 1 – 7 Yonge Street site, also above grade, and the school would be easily accessible to the new park via a bridge. Essentially, the school is in a very strategic location. It is also worth noting that a daycare facility would also be accessible from the PATH network, and conveniently beside the new public school. Between the two eastern blocks, as seen in the image above, there is a proposed PATH connection below-grade that would link the LCBO tower “Work” to the rest of the system. Public comments and questions ranged from where dogs would go to play and relieve themselves (concerned that the new park would be overrun), while others suggest that as part of the affordable housing plans, (initially the developers are looking at 5% of the homes to built would be affordable units), the developers should consider assisted living facilities for the aging and elderly populations, given how the precinct will include other community facilities. Another person asked why Harbour St. couldn’t be for pedestrians only, as a large influx of cars could dominate the area. A staff member from the City of Toronto said the development of the precinct would add about 600 trips of cars in the morning hours, and add 4000 people by foot. 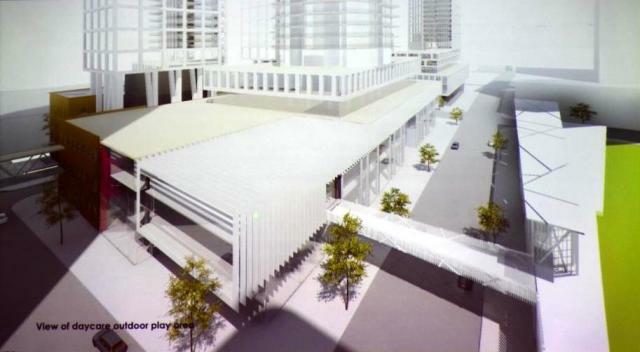 The street plan comes from the City’s approved Lower Yonge Precinct Plan. The use of surface parking on the LCBO office tower block for the LCBO flagship store sparked some questions, with one man saying it would be a waste of space and missed opportunity for the site. This seems to be the general consensus as was also expressed last week at the DRP. 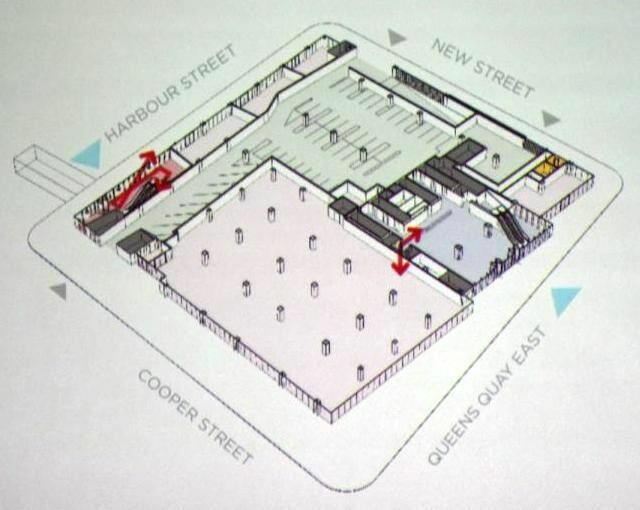 The City responded that the surface parking is all contained within the podium, and is seen as essential, by the LCBO for their flagship store’s business model, one which caters heavily to serving Downtown restaurant and bar owners. It will be a lengthy journey before the development sees approval from the City, and could take up to 15 years to fully build-out this new neighbourhood. The first block to go up will be the LCBO office tower and store. In the meantime, there are more renderings available in our dataBase file, linked below. We will keep you updated when more information becomes available on this development. Want to get in on the discussion? Feel free to comment in the space provided on this page, or join in the ongoing conversation in our associated Forum thread.